As long as the root causes of the Israeli-Palestinian conflict remain unresolved, occasional outcroppings of violence, like the current mini-war in Gaza, are inevitable. 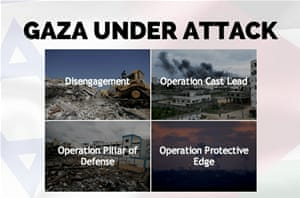 This is the third major Israeli offensive against Hamas and the people of Gaza in the last six years. Refusing to accept international legality as the basis for resolving its dispute with the Palestinians, Israel's right-wing government is ever ready to resort to military force. With a degree of cynicism that is difficult to comprehend and impossible to condone, Israel's leaders describe their periodic incursions into Gaza as "mowing the lawn". Now, once again, and with characteristic callousness, they have unleased the full force of the IDF against Gaza's captive population. The death toll in the current round of hostilities is a grim reflection of the asymmetry of power between the fourth strongest army in the world and a virtually defenceless civilian population. In the first ten days of aerial bombardment, the "score" was 260 Palestinian dead, mostly civilians, and one Israeli. By launching a ground offensive on July 17, Israel sharply escalated the death toll to over 300; destroyed many more houses, hospitals, and water plants; and displaced some 50,000 people out of their homes. "Operation Protective Edge" has thus turned the densely populated Palestinian enclave on the eastern shore of the Mediterranean into a living hell. Both sides claim to be responding to aggression by the other side. The stated aim of Israel's incursion into the strip is to put an end to the firing of rockets by Hamas militants on Israeli civilians. Hamas, the Islamic party that rules Gaza, claims it is engaged in legitimate resistance to Israel's military occupation and that the rockets fired by its military wing were a response to the violent IDF crackdown on the West Bank following the abduction and murder of three Israeli youths. The chain of action and reaction is endless. But the underlying cause of the violence is the Israeli colonialism. In 2005 Israel carried out a unilateral disengagement from Gaza but under international law it is still the occupying power because it controls access to the strip by land, sea, and air. Israel's pullback did not herald freedom for the Gaza Strip. On the contrary, it turned it into an open-air prison and a convenient punch-bag. In 2006 Hamas won a free and fair election but Israel and its Western allies refused to recognize the democratically-elected government and resorted to economic measures to overthrow it. In 2007, following the Hamas seizure of power in Gaza, Israel imposed an economic blockade, cutting it off from the West Bank and from the rest of the world and inflicting indescribable suffering on its 1.8 million inhabitants. A blockade is a form of collective punishment proscribed by international law. So for the last seven years the entire population of Gaza, mostly refugees from previous Arab-Israeli wars, has been subjected to an illegal, inhumane, and unrelenting siege. Israeli PM Benjamin Netanyahu's handling of the current crisis is of a piece with his general approach: to shun diplomacy and rely on brute military force to preserve the status quo - with Israel in direct control of the West Bank and remote control of the Gaza Strip. His ultimate goal is hegemony, not co-existence. He was actually opposed to the withdrawal from Gaza in 2005 and, rhetoric aside, he continues to reject a two-state solution to the conflict. During the nine months of Israeli-Palestinian peace talks orchestrated by secretary of state John Kerry, Netanyahu did not put forward a single constructive proposal and all the while kept expanding Israeli settlements on the West Bank. Kerry and his adviser, General John Allen, drew up a security plan that they thought would enable Israel to withdraw from most of the West Bank. Israel's serial refusnik dismissed it contemptuously as not worth the paper it was written on. When Hamas and Fatah reached an accord in April, Netanyahu went on the offensive, denouncing it as a vote not for peace but for terror. For him any sign of Palestinian unity or moderation is a threat to the existing order with Israel as the dominant power. The unity government produced by the accord in early May was in fact remarkably moderate both in its composition and in its policies. It is a government of Fatah officials, technocrats and independents without a single Hamas-affiliated member. To escape isolation and bankruptcy, Hamas handed over power to the Fatah-dominated, pro-Western Palestinian Authority in Ramallah. The unity government explicitly accepts the three conditions of the United States and European Union for receiving Western aid: recognition of Israel; respect for past agreements; and renunciation of violence. Israel responded to this promising development by what can only be described as economic warfare. It prevented the 43,000 civil servants in Gaza from moving from the Hamas payroll to that of the Ramallah government and it tightened siege round Gaza's borders thereby nullifying the two main benefits of the merger. The military assault on Gaza completely disrupted the work of the new government, unfairly recast Hamas as a terrorist organisation pure and simple, and inflicted additional horrors on the long-suffering population of the strip. What is needed now is an immediate ceasefire. The Egyptian ceasefire proposal of July 15 met Israel's needs but utterly failed to meet the needs of the people of Gaza. Israel was consulted before the proposal was announced; Hamas was not. Hamas found out about the one-sided proposal from the media, not through diplomatic channels. The proposal involved a return to the status quo with calm for Israelis but with the people of Gaza continuing to live under a crippling siege. Not unreasonably, Hamas demands an end to Israeli aggression, the easing of the blockade by Israel and Egypt, and the release of recently rearrested prisoners. It refuses to return to the status quo ante because it is intolerable. Beyond a ceasefire to end the current round of fighting, the international community will need to tackle the much tougher task of persuading Israel to abide by the laws of war, respect UN resolutions, end the odious occupation, and recognise the natural right of the Palestinians to live on their land in freedom and dignity. Avi Shlaim is an Emeritus Professor of International Relations at Oxford University and the author of The Iron Wall: Israel and the Arab World and Israel and Palestine: Reappraisals, Revisions, Refutations. 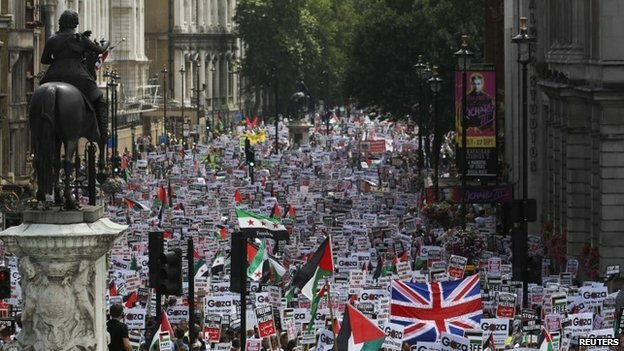 Thousands of people have marched through central London to call for an end to Israel's ground campaign and rocket attacks on Gaza. 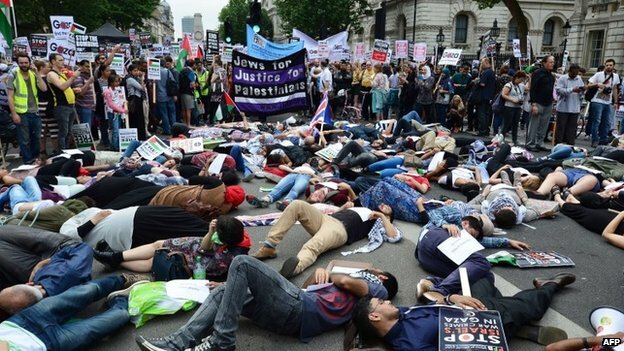 Protesters marched from Downing Street to the Israeli embassy in Kensington. A police blockade stopped them from gaining access. Whitehall, Trafalgar Square, Piccadilly and Hyde Park Corner were closed. 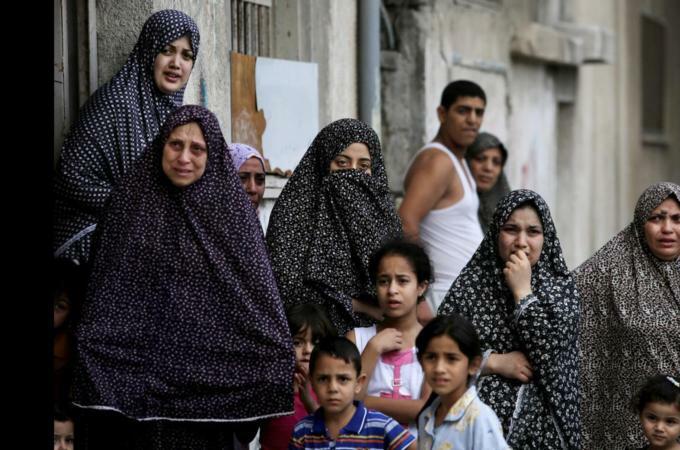 More than 300 Palestinians have been killed since 8 July, officials in Gaza report. Five Israelis have died. Before the event up to 15,000 people were expected to attend. However, the police were not able to verify how many were there. The event was organised by the Palestine Solidarity Campaign and is part of a national day of action. Labour MP Diane Abbott was among the speakers to address protesters as they gathered in Whitehall. "I am here to show solidarity with the people in Gaza," she said. "We call for an end to the occupation and justice for Palestinians." Organisers repeatedly told the crowds to spread out during the speeches over fears people were being crushed. Two children were pulled over a barrier close to the stage and one organiser said 10 people had fainted in the crowd. Israel launched ground operations in Gaza following 10 days of air strikes, which failed to stop Hamas firing rockets across the border. It says the ground operation is necessary to target a Hamas tunnel network, which the Israel military could not do only from the air.